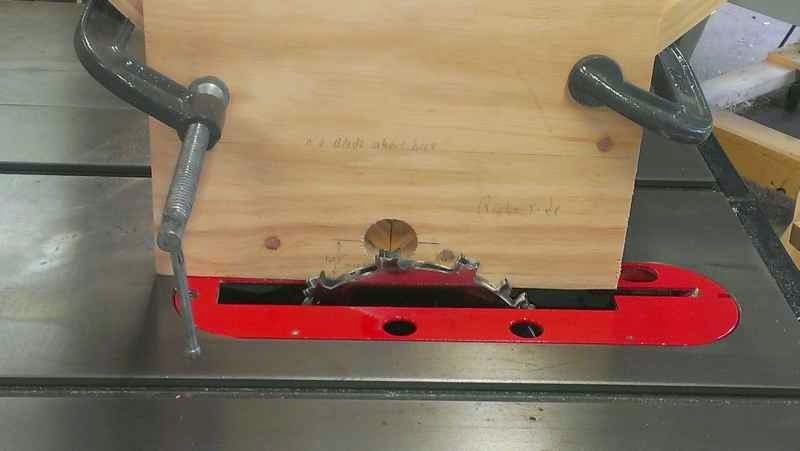 I wrote recently about a spline jig here. In that post I remarked that the hole in the jig was a mistake. Well, I found during the following experience that the hole was a spot on modification. Did I get lucky, or is there a real woodworker deep down trying to get out? Getting back on track now. With my arm now more recovered from shoulder surgery, I moved on to gluing the frame that needs the splines. The joints are simply mitered and glued. The glue is what this post revolves around. I used Titebond Hide Glue, in the photo just by happenstance. 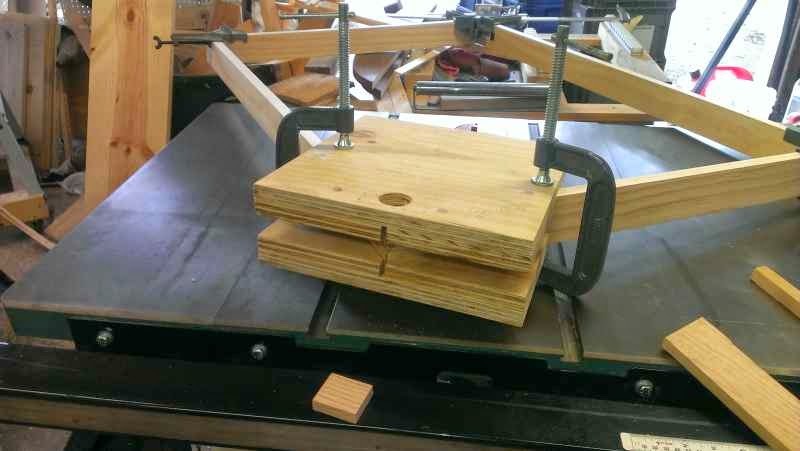 The frame was glued up and put into a ratcheting strap clamp for about 36 hours. After coming out of the straps, the frame was propped against a 55 gallon garbage can used for 'quality' scrap wood. There it sat waiting for me to get more strength in the arm, but the glue had other plans. 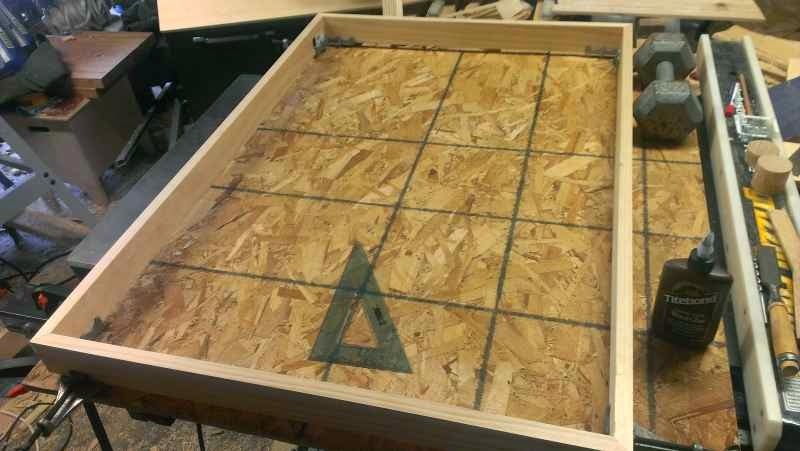 The 55 gallon scrap bin is in sight of the table saw--easy throwing distance is a must. The garage shop is not air conditioned so when it gets too hot or too cold, I try to avoid the garage. However, I was in the garage futzing around while it was still early and cool. As the day got hotter I moved on to more sedate activity. I was using the table saw as a desk while putting together a task sequence for another project (new saw bench design). There I sat staring in the distance pondering some obscure point of the project until the SOMETHING'SNOTRIGHT alarm went off. I focused closer only to see the miters of the frame literally start to fall apart. I estimate the temperature in the shop at the time to be in the upper 80's Fahrenheit. I know hide glue is reversible, but I had no idea that the temperature for doing so was so low. I grabbed the frame before complete separation and managed to get it on a flat surface. The only thing I could think of was getting the splines in ASAP with regular yellow wood glue. Since time was of the essence I used what was immediately available. The table saw was set up with a 1/2 inch wide dado. Rooting around in the scrap bin produced some White Oak left over from the Civil War folding table. The spline is in the foreground of the photo above. The block holding the rest of the uncut splines is off to the right. I used the jointer and my number 5 to get the white oak down to half an inch. I opted for a tight dry fit to keep the corners together until the whole was ready for glue. Then it occurred to me that I could glue and set the spline while still in the jig. A little patience was all that was required to keep unsatisfactory amounts of glue off the jig. The frame is now splined and glued with a single half-inch wide White Oak chunk on each corner. I have a lot more work to do bringing the splines flush, and the aesthetic opportunity is gone. On the plus side, I don't have to worry about separation now, or in the future and paint is as good as stain on this kind of project. The next task to overcome is where to get tempered glass or plastic big enough to cover the 43 X 27 opening. I also am rethinking when and where to use hide glue. I freely admit to jumping on the bandwagon of hide glue just to see what all the hype was about. Experience can be a cheap education. Zebrawood is exotic, expensive, and pretty much useless to me. I suppose a longer explanation is in order. A while back I found a good deal on a Zebrawood off cut. The plan at the time was to use it for knife scales. 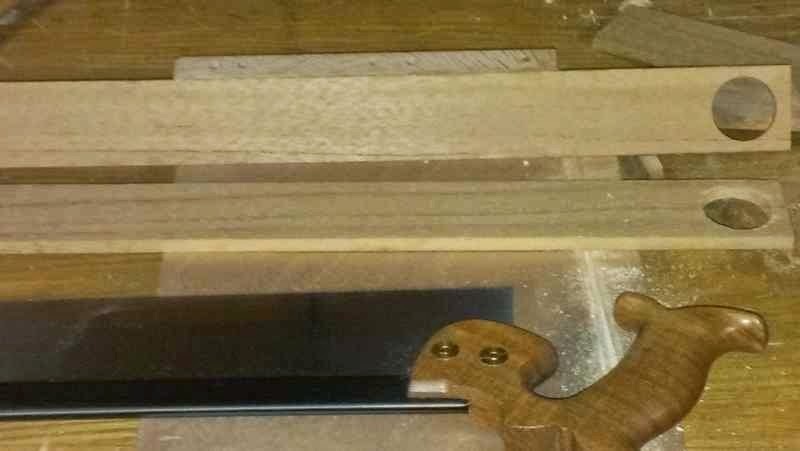 I have a jig setup that is used with knife blanks from Woodcraft. The Tanto style is my favorite knife Woodcraft carries. The jig is for use with a router. The Zebrawood speciman I have was not at all router friendly. 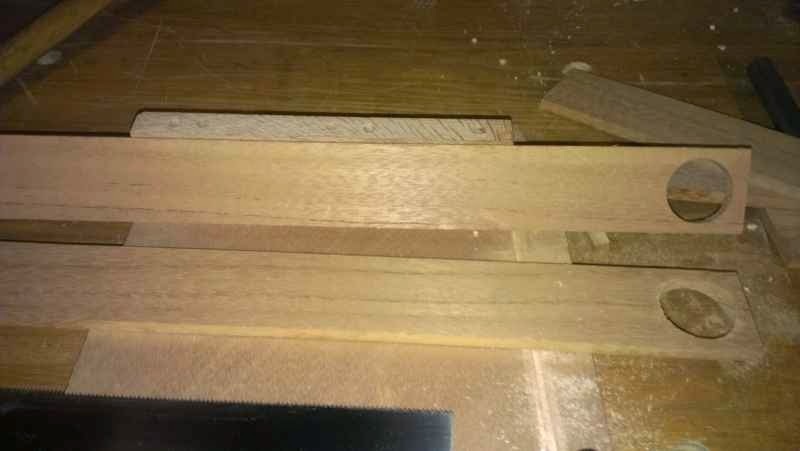 Almost immediately the wood began to splinter and disintegrate under the brand new router bit, ruining the scale blank. I tried changing the bit speed, climb cuts, gentle nudging, and soft curses to no avail. The Zebrawood was too delicate for power tools. Files and rasps are generally meant to be finishing tools. Which translates into 'you can do all your work with them if you have enough patience'. A coping saw and patience with the aforementioned tools were the last resort. I did manage to finish the knife scale, but it looked too crappy to permanently affix to the knife. The rest of the Zebrawood off cut sat under my workbench for nearly two years, until today. I'm still recovering from shoulder surgery so my usefulness in the shop is limited. My three kids are having no more of being pressed into service for my hair brained projects. We (they) have been building shop furniture, shelving, and jigs for when full usefulness of the arm returns. However, cutting one small off cut even smaller is well within my purview. There is another Dutch tool chest in the project pipeline and it needs the locking wood slider thingies. The last one used Walnut off cuts. The next chest is going more exotic and using Zebrawood to lock it. Don't tell anyone, but the wood is tough, but stringy and will probably break if modestly forced. The wood did not succumb to power tools much better this time around. At least the cut was mercifully short on the table saw. The finishing was done with a random orbit sander. Some folks will think it dumb to use an exotic off cut for a utilitarian invisible piece of a project. I guess I don't care: I had the wood, it was the right size, and cannot serve the original purpose for which it was purchased. The next Dutch tool chest will have an African flair to it. Just one more quasi finished part to throw in the corner until I get my arm back. I found a need for a spline jig. Normally I check my print sources and the 'Net for examples or advice on whatever I'm doing. Tonight I was too impatient to wait and threw together a spline jig, or what I think a spline jig should be. I guess it is more correct to say my son was too impatient. I have a shop assistant for a while due to shoulder surgery. We are working on a back lit box to display his vintage movie posters (and a project for the blog once I get my arm back). The two halves are mirror images of each other. I put the hole in so I could see what was happening. The first test proved my thinking wrong. I can't see a darn thing except the frame in there. The splines are going into large shadowbox frames. 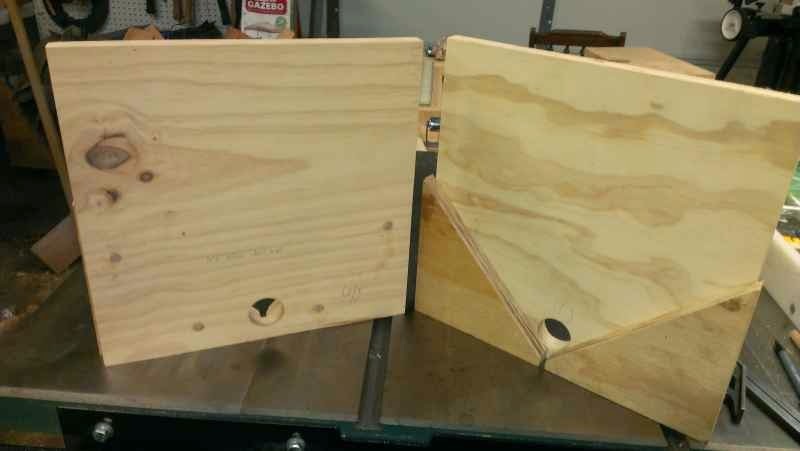 I made the support boards tall enough to get a good clamp hold on the frames when in the jig. The jig will live long enough for the current couple of projects, but something more durable will have to be made for the future I think. Links to more useful spline jigs are certainly welcome below. Typing is still a strain, so it is off to the couch for an ice pack. I don't usually post such large photos, but wanted to show the construction details of the tool box. The corner joints are all finish nailed with no glue. A simple leather strap held on with roofing nails serves as a handle on each side. Notice that the remaining paint on the tools exactly matches the toolbox. 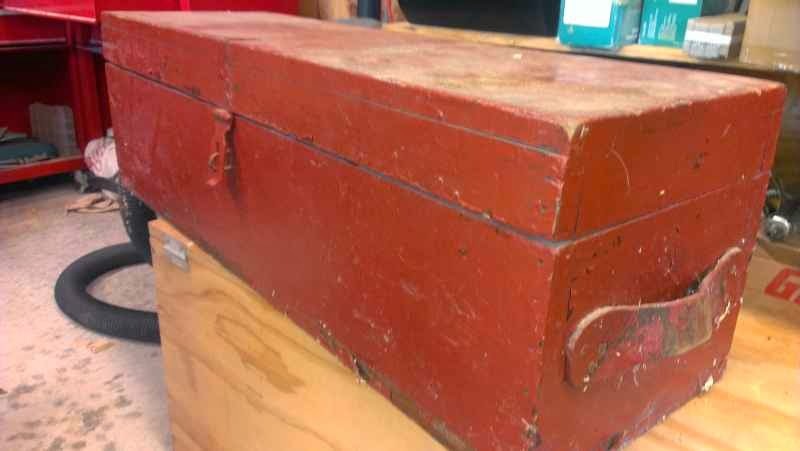 There is no other personalization on the tools or box so my assumption is that the original owner/builder used the red paint to mark the stuff as his. By all means offer any alternative theories below. 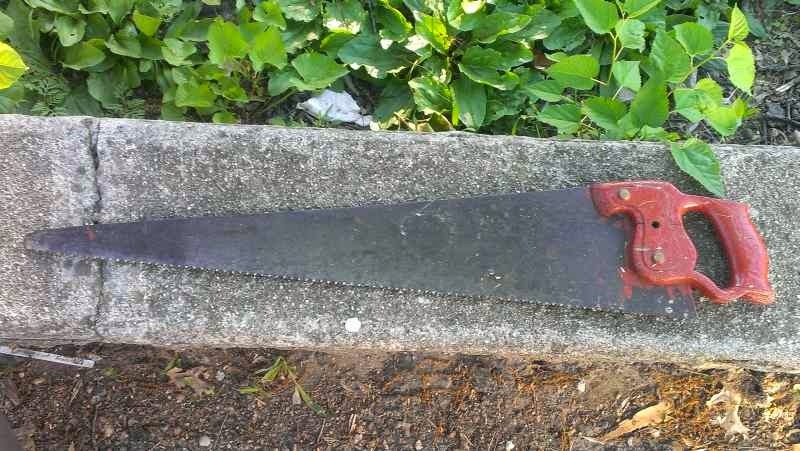 The saws were well used and kinked in multiple places. They aren't even worth practice sharpening. Also, note again the red paint on the handle. 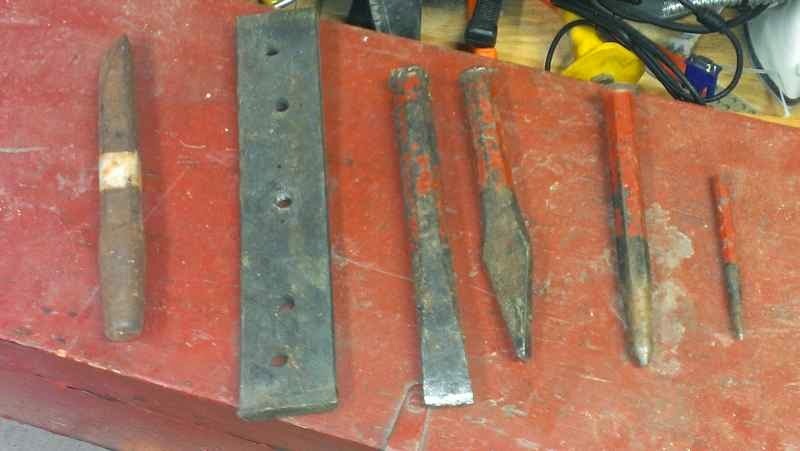 The best 'find' in this tool box is the dowel plate. One of the holes is even threaded for whatever purpose; I'll use it to thread dowels if need be. 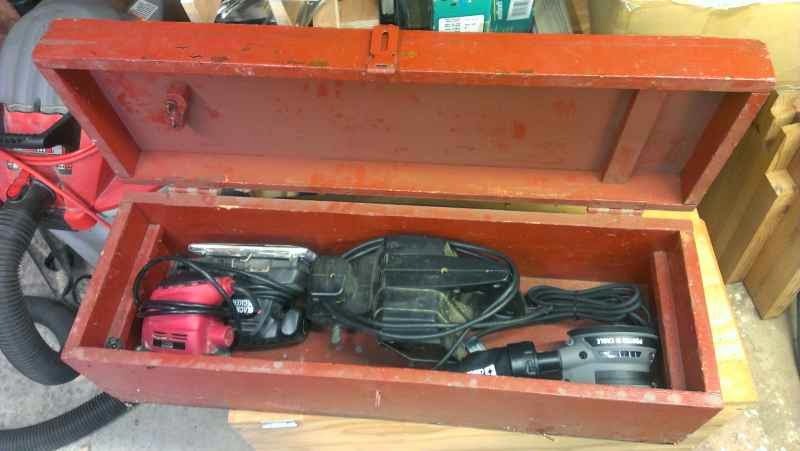 The other tools I tossed into my large Craftsman chest dubbed the Island of Misfit Tools. All of my small sanders fit perfectly in the box. Now the big red toolbox is going to be home to all of my small sanders. The previous owner could care less, the builder may or may not be pleased that this box survived the years to arrive in my care. All I know is that now whenever I need a sander, it should be in the obnoxious red box on the back shelf of the garage shop.